A winged humanoid species introduced in Star Wars Annual #1 is the S'kytri from the planet Skye. In the story, the S'kytri Kharys is working with Imperials to subjugate her people. Luke Skywalker and Princess Leia attack Kharys' fortress to free Han Solo and Chewbacca. Luke Skywalker kills Kharys during the assault, freeing the S'kytri. 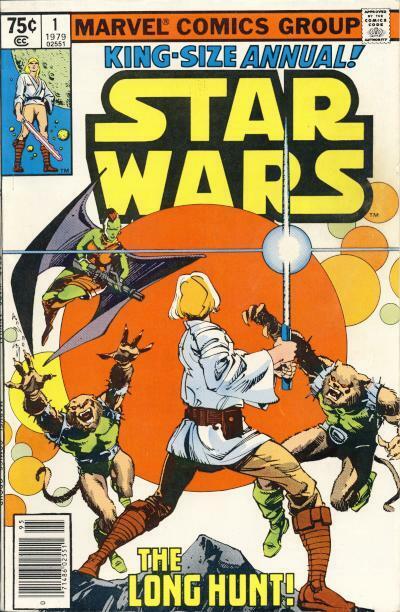 The green-skinned Kharys is shown on the cover for Star Wars Annual #1. In the foreground, Luke is being attack by Kharys' Catuman body guards while she flies above the fray. Another female S'kytri would appear in the Lost Tribe of the Sith - Spiral story arc from Dark Horse. The leader of the Doomed is also a green-skinned S'kytri named Kaliska. The Doomed are a group of Jedi descendants who lived on Kesh and oversee the imprisonment of the Dark Jedi Remulus Dreypa. 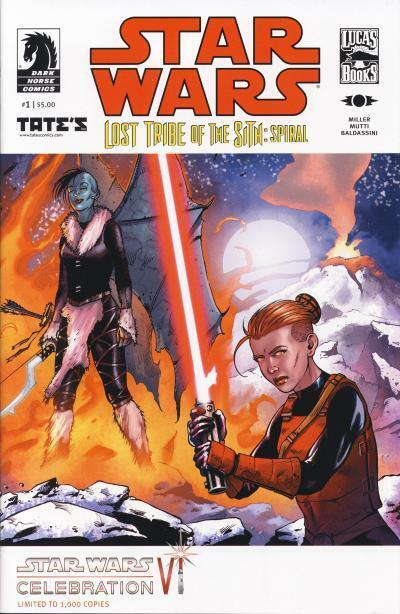 The Tate's Comics exclusive cover for Lost Tribe of the Sith - Spiral #1 shows Kaliska standing behind the Lightsaber wielding Takara. Like Kharys, her head is mostly bald except for a mohawk-like tuft of hair down the middle. The S'kytri are not used in any other Star Wars stories although they are mentioned in various encyclopedias that focus on Star Wars species. 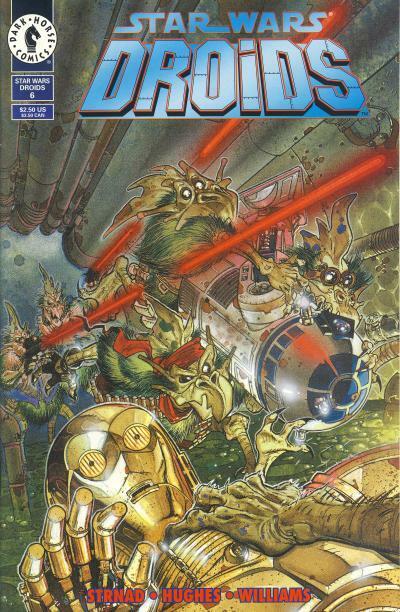 The cover for Star Wars #9 is notable for depicting Jaxxon and Amaiza differently than in the comic. Jaxxon is shown in the story wearing a red uniform with a white collar, gloves, and boots. He is modestly clothed from neck to toe. The cover shows a Jaxxon that appears to be wearing no clothes. Only his right arm and head are shown but it is clear he is not wearing a shirt nor does he have his gloves. The white haired Amaiza on the other hand is immodestly dressed inside the comic and would be right at home in a western saloon entertaining men. On the cover, her hair is colored grey and instead of seeing flesh at her midriff, it is colored to appear like she is wearing a shirt or dress instead of just a brazier. The grey hair makes Amaiza appear older, although she looks roughly the same age as Han Solo in the story. Differences like these occur all the time in comic books; many times the cover artist is not the interior artist and does not have reference material or is working from rough outlines of characters. More of the artwork is shown on the cover of Clásicos del Cine #304. Jaxxon's torso is revealed, disassociating him even more from his depiction inside. We also see more of Chewbacca's arm and rifle. Finally, not obvious on the U.S. cover, near Chewbacca is the head of the Starkiller Kid's droid companion Effie. Looking at this cover, it isn't clear exactly how Chewbacca and Effie are situated and it looks like Chewbacca has a stranglehold on the droid or his arm is passing through the droid's torso. It is cool to see more of the cover on the Mexican edition, although it makes sense why Marvel cropped the art for the U.S. edition. The cropped version effectively removes the problems with Chewbacca and Effie's placement and also covers up the shirtless Jaxxon. An additional benefit of the close-up is the action taking place in the sky above the heroes makes it more likely that Han Solo is firing at other Cloud-Riders that are just out of view versus being a poor shot. The second volume in the Star Wars 30th Anniversary Collection from Dark Horse reprints the 6-part mini-series Jedi vs. Sith. Like the other volumes in this series, it has a matte black cover with the text in silver. Framed in a silver box in the center of the cover is the cover art from Jedi vs. Sith #3 featuring Darth Bane. This volume was the highest priced in the collection retailing for $29.95 and was limited to initial orders. The original mini-series came out in 2001 and some of the story is retold in the Del Rey 2006 novel Darth Bane: Path of Destruction. From the chart, IVX #1 is ranked 2nd for units with 167,703 units and Dark Knight III Master Race is ranked 3rd with 119,114 units. But, according to the top 300 chart for December found on The Comic Chronicles site, these positions are reverse when you take into account the dollar ranking. How is this possible if both comics had an equivalent price of $5.99? This is where the over-shipping of IVX #1 helps out with the unit ranking. For IVX to rank higher by units, Marvel had to over-ship by at least 48,590 units and it is most likely more. Some websites are reporting that retailers received 50% more copies of this comic than ordered. It does not appear any other Star Wars title was part of Marvel's program to send out more books to retailers than ordered in the month of December. Bleeding Cool is reporting that sales for Star Wars #49, titled The Last Jedi and published back in July 1981, have taken off since the latest Star Wars movie name announcement. While the name is the only thing the movie has in common with the comic, it has not deterred some from bidding up the prices on eBay. Interestingly, there is a paperback that uses the same name which was released in February 2013 that is not receiving the same consideration as the comic. This phenomenon is similar to the attention that several Dark Horse comics received that contained the Solo twins Jacen and Jaina and Ben Skywalker leading up to The Force Awakens. Please read the posting Speculator Corner: Star Wars #49 – The Last Jedi – From Marvel Comics. The Comics Chronicles released the December 2016 estimated sales earlier this month. Not surprisingly, the first issue of Justice League Suicide Squad was the top comic for the month, followed closely by the first issue of IVX (Inhumans Versus X-Men.) Star Wars remains Marvel's top selling ongoing title with a return to the top 10 at 7th place. It was joined by the first issue of Doctor Aphra in the 8th place. 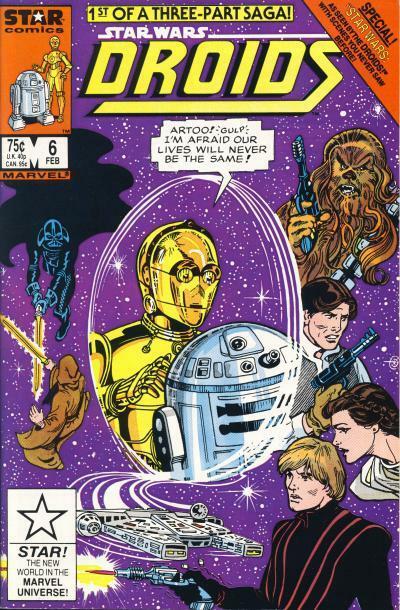 Star Wars #26 was advertised heavily by Marvel as the first issue of an arc starring Yoda. This advertising presumably paid off as the title saw an almost 40% increase in unit sales from the previous month. Marvel over-shipped (sent more copies to retailers than ordered) on several titles in December and it is entirely possible Star Wars #26 as well as other Star Wars titles benefited from this. Hopefully we'll know in the coming months which had the bigger impact on sales, but we can see from looking at the dollar position on top 300 chart that over-shipping had at least some impact (the table above is the monthly ranking for the units sold.) The Star Wars universe is rich with characters and while Yoda is one of the more popular, I believe Marvel can continue to inject interest in their Star Wars titles by introducing some of these familiar characters into stories mixed with their new creations. The main characters are the bread and butter of the Star Wars brand, but the background characters can provide a wealth of stories if used correctly. Two issues of Doctor Aphra were released in December. Compared to the other ongoing Star Wars series, Doctor Aphra #1 debuted with the lowest unit sales; the nearest title was Kanan with first issue sales of over 108,000 units. It is a tad unfair to compare Doctor Aphra to other ongoing Star Wars titles; Doctor Aphra is a character created for the comics without representation in other media. It is fair to compare Doctor Aphra's sales to the title it replaced however, Darth Vader. Darth Vader #25 sold over 111,000 units, but that was a last issue that received a huge bump due to variants and advertisement. Darth Vader #24 sold over 75,000 units. Unfortunately, Doctor Aphra #2 sold just over 61,000 units or 14,000 units less than Darth Vader #24. I'm doubtful Marvel intended to end a decent selling title to replace it with a lower selling title. No doubt, they were hoping this fan favorite character by her creator would sell better. It is possible issue #2 is an anomaly and subsequent issues sell more units. This is not unheard of since Darth Vader #2 and 3 sold approximately 100,000 and 85,000 units respectively, but rebounded to 123,000 units with the 4th issue. We'll know more in the next few months. Another title replacement is also seeing lower numbers than its predecessor; as of issue #9, Poe Dameron is now selling less units than Kanan at this point in that title's life. I could argue the stories in Kanan were stronger throughout it's run and it is possible that is the reason for the lower sales. The first story arc in Poe Dameron was strange and perhaps not the strongest start to an otherwise decent series. Marvel traditionally does not push their mid-tier titles, instead allowing them to end so they can restart new titles with a first issue. I'm no longer hopeful that Poe Dameron will survive until the next Star Wars movie in December 2017 unless Marvel decides it is worth saving. No issues of a mini-series were released in December. Marvel has announced mini-series for Darth Maul and the Rogue One movie adaptation. The average sale per issue rebounded significantly thanks to Star Wars #26 and Doctor Aphra #1. It would rank 14th on the top 300 chart for the month of December. Star Wars trade paperbacks, reprint titles, and reorders are not accounted for with these numbers. The Star Wars trade paperbacks are strong sellers. Take a look at the Star Wars Sales Estimate Chart and please read the blog posting December 2016 comics sales estimates online; all new Comichron charts are now sortable, searchable! The Comics Chronicles released the November 2016 estimated sales over a month ago. Only 3 comics sold over 100,000 copies, DC's Batman #10 and 11 and Marvel's Civil War II #7. Star Wars #25 is Marvel's top selling ongoing issue, not counting first issues for new titles. This is faint praise however, as Star Wars took 15th place for the month. No other Star Wars comic finished in the top 25. While Darth Vader has not traditionally sold as well as the main Star Wars title, it's absence was missed in November. Without Darth Vader's strong unit sales, the average sale per issue fell to an all time low of 53,995 units which would rank as 37th on the top 300 chart for November. The main Star Wars title shed a nominal number of unit sales. Marvel has been advertising the Yoda arc starting in issue #26 heavily, so I expect this to contribute to a rebound in unit sales next month. Also, Doctor Aphra starts next month which should help recover some of the unit sales lost when the Darth Vader title ended. Less than 200 copies separates the sales for Kanan #8 with Poe Dameron #8 which is negligible since these numbers are just estimates. The Poe Dameron title has many things in its favor over Kanan: it is based is based on a major character from the current Star Wars trilogy, it is based in the period just before the movie, and it is patterned after the fan-favorite X-Wing series from Dark Horse. On top of that, there have been appearances by General Leia and it has filled in some of the blanks on the state of the galaxy between the original trilogy and this new era. With all this going for the title, Marvel must be frustrated seeing sales drop down to these numbers. Star Wars Annual #2 sold about 30,000 units less than Star Wars Annual #1 11 months earlier. This further shows the decline in sales the Star Wars titles have had in the past year. The final issue of the Han Solo mini-series fell just over 4,000 units and The Force Awakens tumbled a surprising 5,800+ units. Han Solo's final number is on par with another critically received mini-series, Lando. The unit sales for The Force Awakens #6 set a new low for the modern Marvel era for a non-reprint Star Wars issue. The average sale per issue set a new low and it would rank 37th on the top 300 chart for the month of November. Star Wars trade paperbacks, reprint titles, and reorders are not accounted for with these numbers. The Star Wars trade paperbacks are strong sellers. Take a look at the Star Wars Sales Estimate Chart and please read the blog posting November 2016 comics estimates now online. It is hard to believe today, but Ralph McQuarrie's art for the Star Wars movies was not original meant to be seen by the public. George Lucas used several Ralph McQuarrie paintings based on the script for Star Wars to help convince 20th Century Fox Studio to fund the making of the movie. His conceptualization of the Star Wars universe was extremely important to the success of Star Wars, as many of the characters, ships, and locations seen in the movie are based on his work. The Star Wars is an 8-issue comic adaptation of George Lucas' original draft screenplay from 1974. 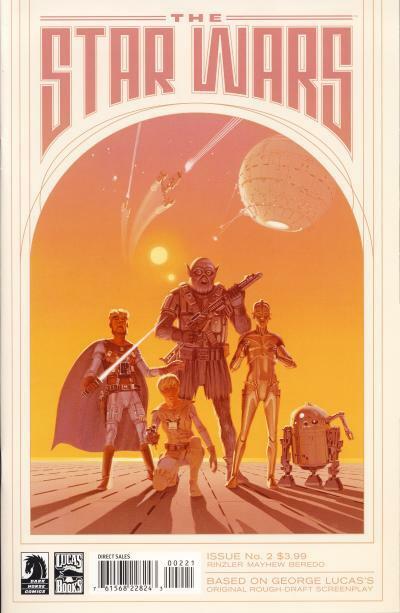 Dark Horse used a McQuarrie painting, titled Fabulous Five, as a variant cover for The Star Wars #2. Surprisingly, Dark Horse did not use more McQuarrie paintings as variant covers for this series and the Star Wars #2 is the last issue of this series to even sport a variant cover! Imagine Marvel today forgoing a variant cover on any Star Wars issue let alone an obvious variant cover based on McQuarrie artwork! The Fabulous Five was painted in 1975. Since the painting coincides with the completion of the second draft of the movie, I believe the characters in the painting from left to right are: Deak Starkiller, Luke Starkiller, Chewbacca, C-3PO, and R2-D2. In the background are Y-Wing Fighters attacking the Death Star. Notice the Death Star's weapon is located on the bottom. Replica of Imperial STORMTROOPERS "HOVERCRAFT" VEHICLE holds 11 Action Figures. 6 STAR WARS sounds: C-3PO, R2-D2, STORMTROOPER, and others. Front hatch opens. Manual rotating laser gun and swiveling radar disk. 6 side compartments hold prisoners. Action Figures, batteries not included. While the text for this vehicle says the side compartments are for prisoners, most of the advertisement photos show Imperial Stormtroopers occupying those 6 side compartments. The Imperial Troop Transporter appears in the stories for Star Wars #31 and #32. Star Wars #32 is titled The Jawa Express for good reason; Luke Skywalker, Han Solo, Chewbacca, C-3PO, and R2-D2 hitch a ride on a Jawa Sandcrawler to escape from Imperial Stormtroopers. We see Baron Orman Tagge and his brother Silas Tagge use a Troop Transporter to visit a successful demonstration of the Omega Frost weapon on another Sandcrawler and then use the Transporter's laser gun to destroy the frozen heap. Towards the end of the tale, we get to see our heroes in a Sandcrawler take on several Troop Transporters. 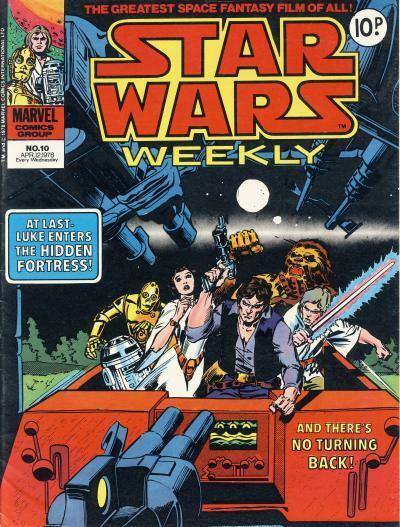 While the Imperial Troop Transporter is never shown on a U.S. cover, the vehicle does appear on the cover of Star Wars Weekly #78. 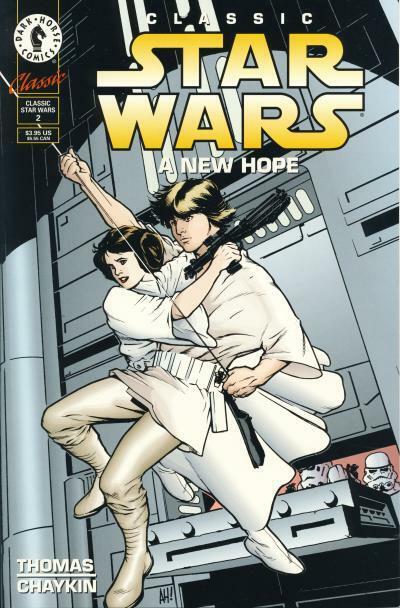 In a scene not show inside the comic, Luke is standing on the Sandcrawler, wielding two pistols, and attacking a Transporter. Two more Transporters are approaching in the background. The Expanded Universe is a treasure trove of Star Wars stories. The last major series of books from Del Rey before the Expanded Universe was done away with is the 9-novel Fate of the Jedi. John Jackson Miller's Lost Tribe of the Sith eBooks are prequels to Fate of the Jedi, chronicling the history of this missing Sith tribe on the planet Kesh. 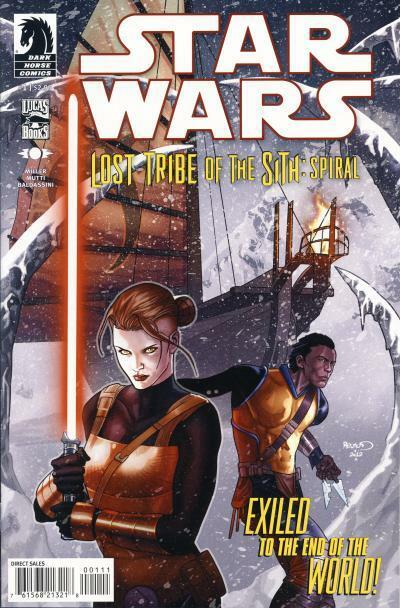 The Lost Tribe of the Sith - Spiral comic book is a continuation of the novels. This comic series is different than many Star Wars comics. The story reads more like a fantasy tale mixed with some Star Wars elements. The story takes place entirely on the planet Kesh because the inhabitants of the planet do not have interstellar travel, although a spacecraft is introduced and destroyed later in the arc. In the first issue, the main characters of Parlan Spinner and Takara Hilts are introduced and spend half the issue in the Sith city Tahv where the backstory is fleshed out. They travel from Tahv to the unexplored frozen continent Eshkrene aboard a wooden sailing ship. Both Parlan and Takara had separate plans to mutiny and take the ship to the recently conquered continent of Alanciar, but their plans fail and both end up being pursued by the captain and his men when they are saved by a group calling themselves the Doomed. 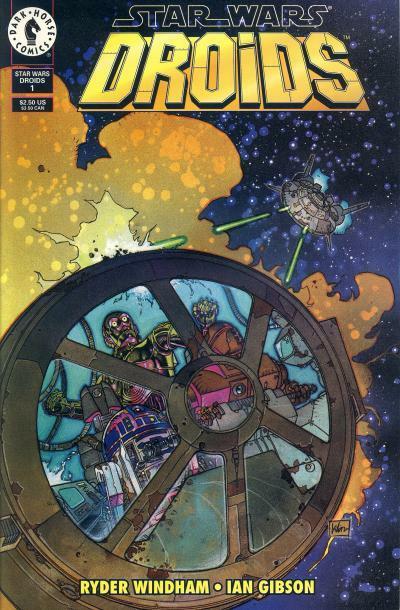 The regular cover for issue #1 shows Takara and Parlan with the wooden ship in the background. Being a Sith, Takara has a traditional red lightsaber. The same month the first issue was released, Star Wars Celebration VI took place in Orlando, Florida. Tate's Comics in Florida offered an exclusive cover for the first issue limited to 1000 copies at this convention. This is Tate's Comics 2nd Star Wars exclusive cover. The exclusive cover shows Takara in a similar pose to the regular cover. Behind Takara is the leader of the Doomed, Kaliska. Kaliska is a S'kytri which is the winged species introduced in Marvel's Star Wars Annual #1. Star Wars: Lost Tribe of the Sith was not announced as a limited series and presumably, if it sold well, it would have followed Dark Horse's usual mini-series within a series pattern. Like many Star Wars titles during this period however, this 5-issue story arc was all that was released. 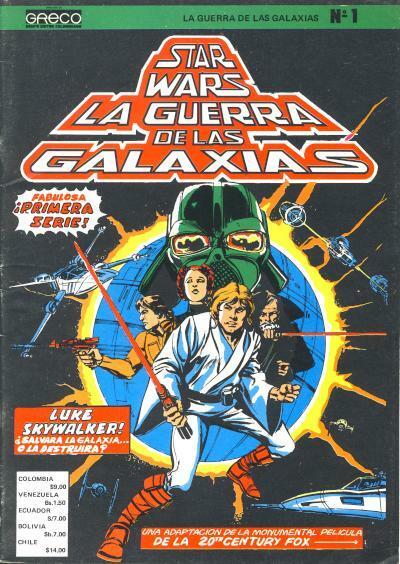 Editorial Bruguera published 5 collections, with the first 2 volumes containing 3 issues each of the Star Wars movie adaptation. Not as large as the Marvel Special Edition Featuring Star Wars treasuries but still larger than the average comic book, the 2 collections contain the same cover art as the first 2 treasuries. 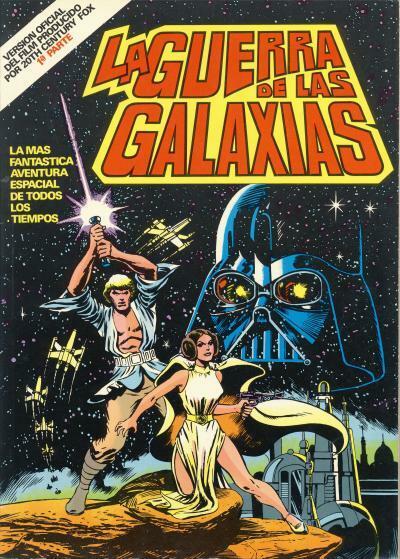 The cover for the first issue exclaims La Mas Fantastica Aventura Espacial De Todos Los Tiempos or The Most Fantastic Space Adventure of All Times. Despite a slightly smaller size, the Spanish edition of the cover actually shows slightly more of the artwork. It is clear Luke Skywalker and Princess Leia are standing on an outcrop an the top of Darth Vader's helmet is not covered. 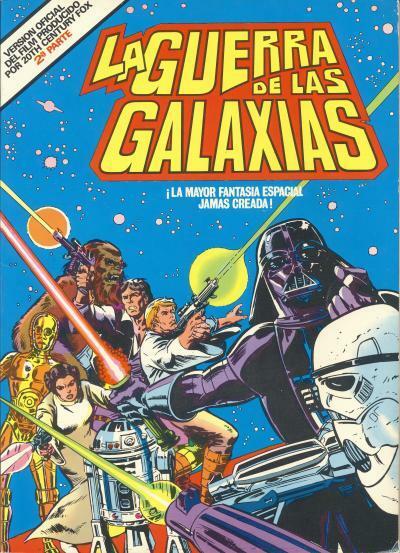 The cover for the second issue contains a blurb that reads ¡La Mayor Fantasia Espacial Jamas Creada! or The Greatest Space Fantasy Ever Created! Like the first issue, the artwork on the cover is cropped different, so more art on the edges can be seen. Not surprisingly, Marvel will be publishing a Rogue One adaptation. The 6-issue mini-series will begin in April and include scenes not shown in the movie or in the novel. Please visit the article Inside Marvel's Rogue One comic adaptation over at Entertainment Weekly for more information and a short interview with the comic's writer Jody Houser. As hard as it is to believe, Star Wars turns 40 years old this year. Marvel has already announced they will be issuing 48 variant covers to celebrate this milestone. I suspect there will be additional 40th anniversary announcements as the year progresses. 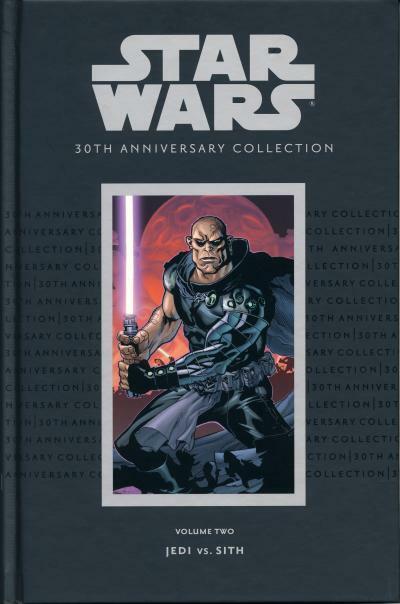 Starting in March 2007, Dark Horse published a 12 volume hardcover collection celebrating the 30th anniversary of Star Wars. Each volume in the collection features a reprinted story arc from one of the Star Wars titles and was limited to initial orders. 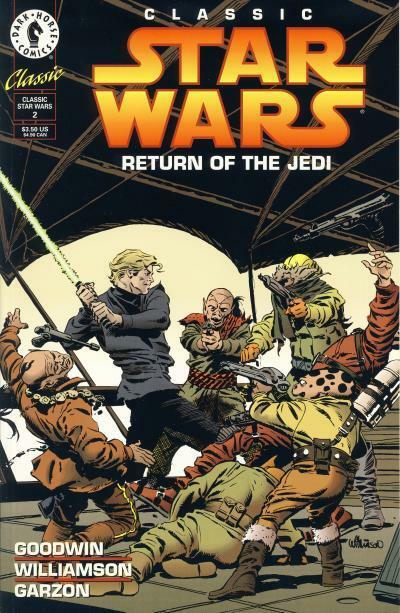 The first volume in this Star Wars 30th Anniversary Collection reprinted the 2-part mini-series Tales of the Jedi: The Freedom Nadd Uprising. It retailed for $16.95, which for only 56 pages of story, is an expensive price. All of the covers in this series feature a matte black background with the text in silver. Framed in a silver box is a portion of one of the reprinted issues' covers; for this volume the cover art is from The Freedom Nadd Uprising #1. The Freedom Nadd Uprising story was probably picked for this collection because the trade paperback had been long out of print and was bringing high prices on the secondary market. 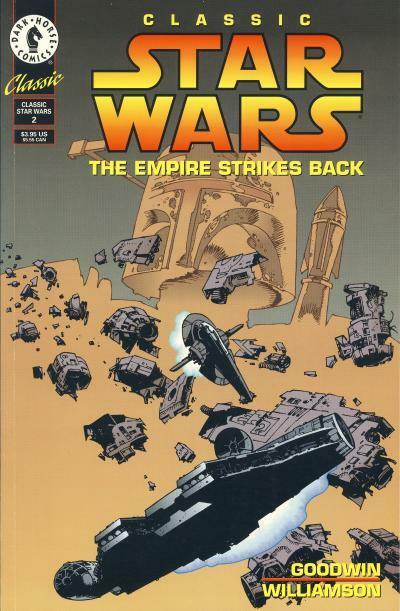 Dark Horse published 34 Star Wars comics in 1994, more than doubling the 16 comics they published in 1993. 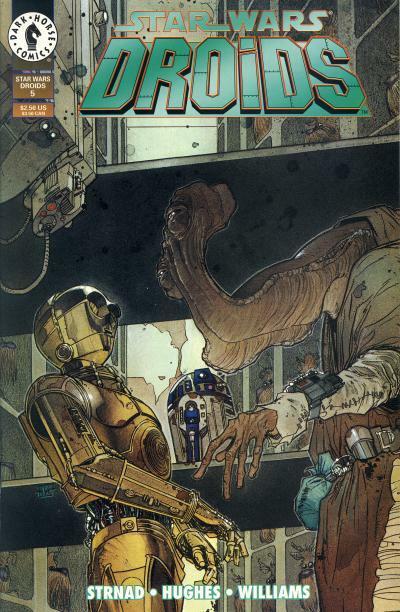 Star Wars comics were a huge success for Dark Horse and they expanded their offerings by introducing the Droids title early in the year. 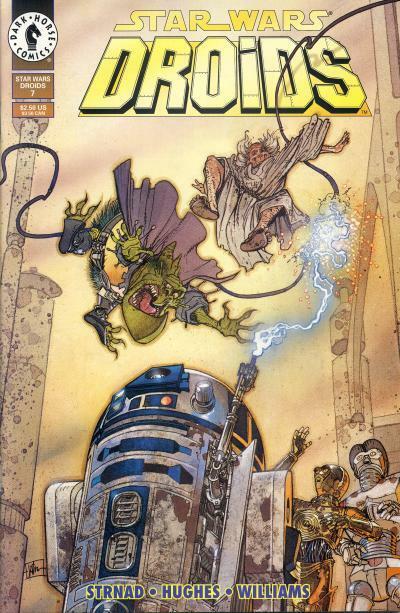 Like Tales of the Jedi in 1993, they ran a 3-part preview of Droids in their Dark Horse Comics anthology. Published from January to March, Dark Horse Comics #17 - 19 contains a Droids story that continues into the 6-part Droids mini-series that begins the following month. 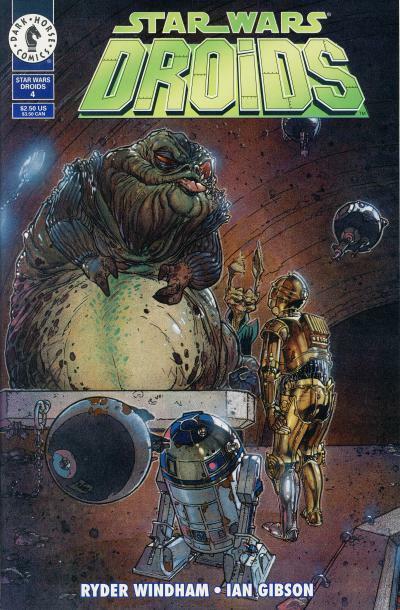 With Tales of the Jedi, Dark Horse had a 6 month gap between the preview story in Dark Horse Comics and the start of the mini-series, but with Droids, they wasted no time publishing the new title. Clearly, Dark Horse was confident in the Star Wars brand. Just under half of the Star Wars line in 1994 includes reprints under the Classic Star Wars banner. 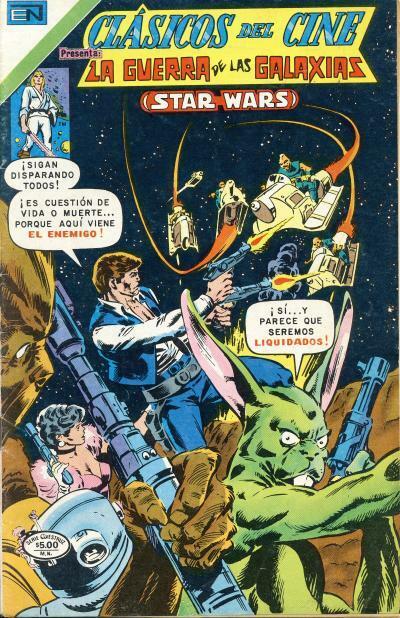 The final 5 issues of Classic Star Wars title featuring the Archie Goodwin and Al Williamson comic strips completed in June and Dark Horse immediately began reprinting other Star Wars comic material. 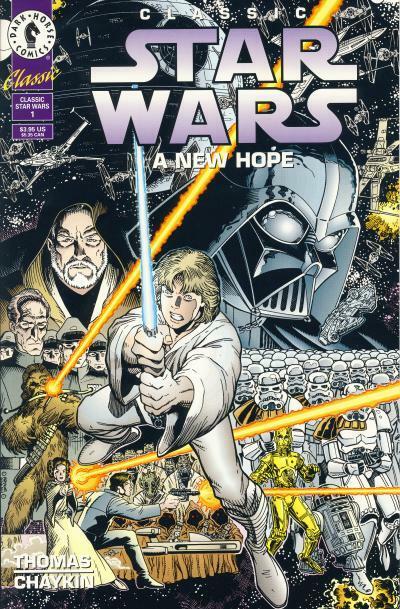 Also in June, Classic Star Wars: A New Hope #1, a prestige format comic with a cover price of only $3.95, was published containing the first half of Marvel's Star Wars movie adaptation. This was followed the following month by the second half of the adaptation. 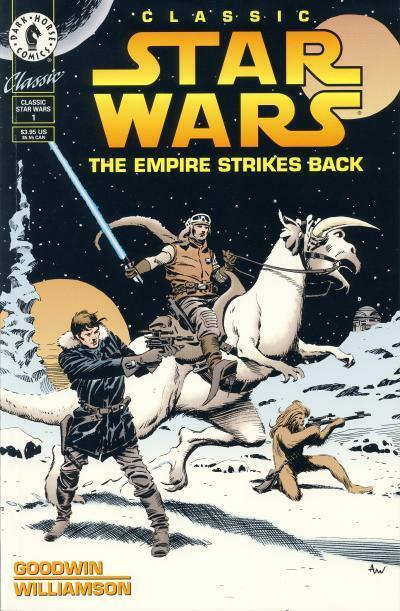 Using the same prestige format, Dark Horse also published The Empire Strikes Back and Return of the Jedi in 2 parts each. This would be the first of many Dark Horse reprints of the Marvel movie adaptations. 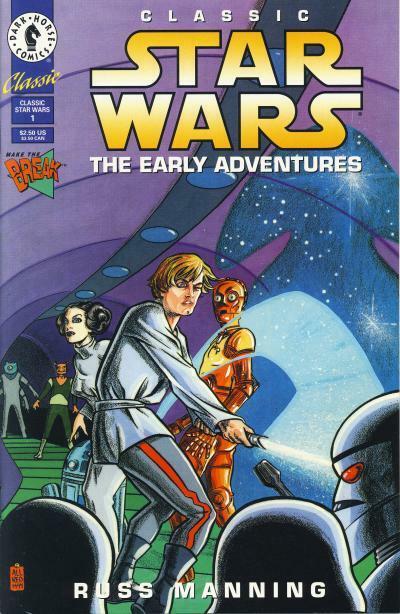 Star Wars comic fans were in for a treat with the title Classic Star Wars: The Early Adventures starting in August. 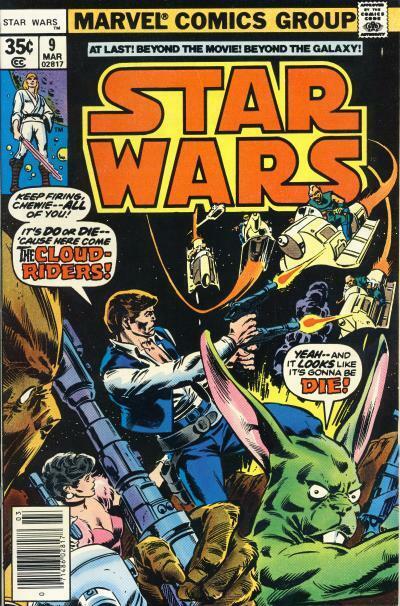 This title reprints the, at the time seldom seen, Russ Manning Star Wars comic strips. Manning's work predates the classic Al Williamson and Archie Goodwin strips. He worked on the strip in 1979 and 1980 when he retired due to poor help. (Russ Manning passed away in December 1981.) Unfortunately, The Early Adventures title does not contain all of Russ Manning's work; it is missing the Sunday-only The Kazhyyyk Depths story. Even so, the work that is collected is clever and fun, written and drawn by an old-school comic veteran. 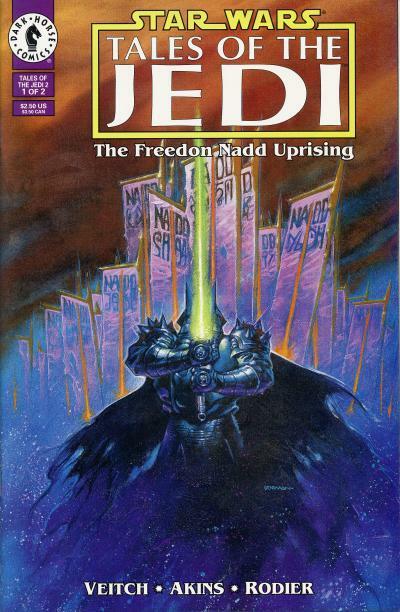 6 months after the 5-part Tales of the Jedi mini-series wrapped in February, Dark Horse continued the series with the 2-part Tales of the Jedi - The Freedom Nadd Uprising mini-series. Dark Horse was fond of the "mini-series within a series" style of publishing. This allowed them to present a story arc with it's own title, including a new #1. It also gave Dark Horse the freedom to stagger the publication of the stories, so readers were not disappointed when a new issue was not published the very next month. 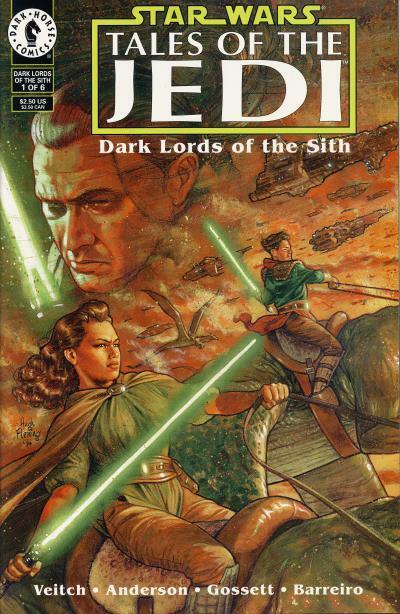 Following The Freedom Nadd Uprising tale, the next story arc is titled Tales of the Jedi - Dark Lords of the Sith. 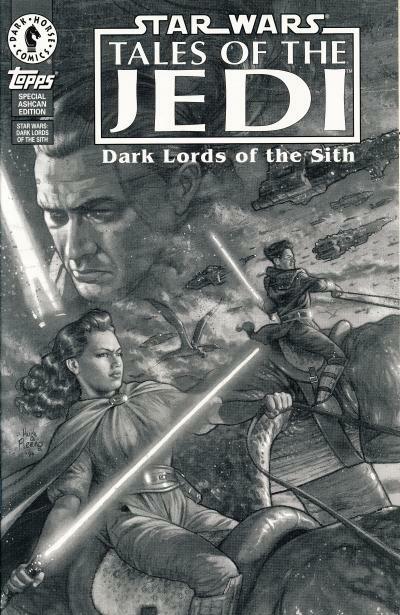 A preview "ashcan" issue was released containing the first 12 pages of Dark Lords of the Sith #1. This preview issue was included with Topps' Star Wars Galaxy Magazine #1 in September. The first issue of the 6-part mini-series was published in October. 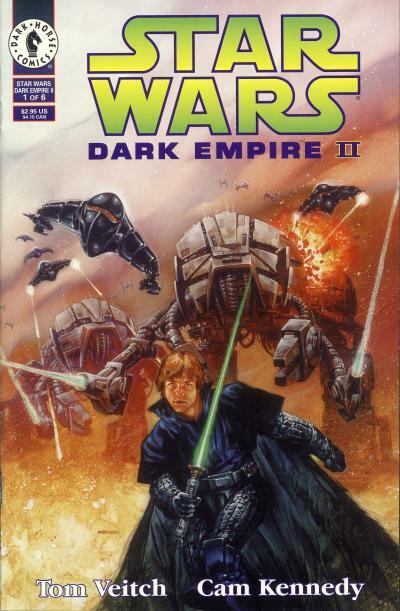 Dark Horse would finish the year by publishing a sequel to their inaugural hit Star Wars: Dark Empire. 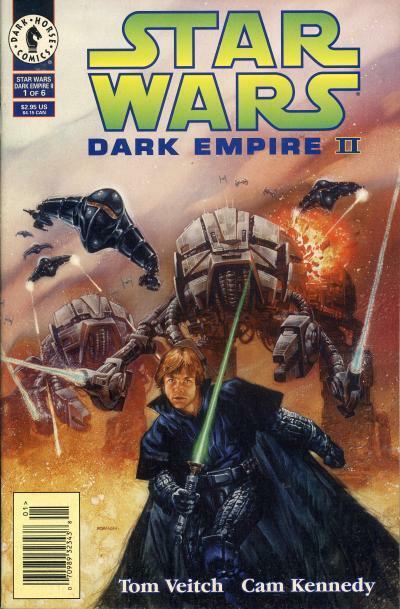 Star Wars: Dark Empire II #1 was published in December and contains the same creative team of Tom Veitch and Cam Kennedy. It starts where the previous mini-series ended; after the death of Emperor Palpatine's clone, leaders of the Empire are feuding for control of the Empire. Unlike the first series, this mini-series does not break any new ground, instead it retreads much of the original story. Dark Empire II #1 is notable however for a non-story related reason; it is the first Dark Horse Star Wars title distributed to newsstands. 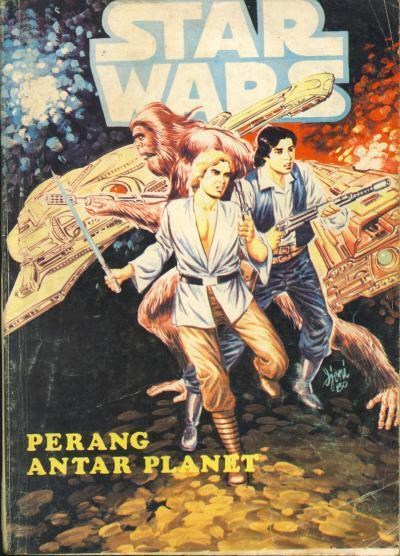 Perang Antar Planet or A War Between the Planets is another digest-sized comic published in Indonesia. Like many of the other Indonesian Star Wars digests from Yayasan Karya Bhakti Bandung, this comic contains two stories. The cover and lead story says Star Wars, but the science fiction tale is not a Star Wars story. It has a registration date of 24-10-1980. Like Star Wars: Planet Liar, I believe they re-purposed a science fiction story and called it a Star Wars story presumably to sell more comics. Since so many different digests have surfaced in Indonesia, Star Wars must have been popular there. The backup story in this comic is dated 2-4-1974 and this comic was probably published in the early 1980s. The artist for this cover is the same artist that drew the cover for Star Wars: Planet Liar. The art features a nice depiction of Luke Skywalker, Han Solo, and Chewbacca. There are two spaceships in the background, but neither are recognizable from Star Wars. Chewbacca's feet are drawn very monkey-like. Overall, it is a nice cover but, unfortunately, there is no Star Wars story inside this comic. 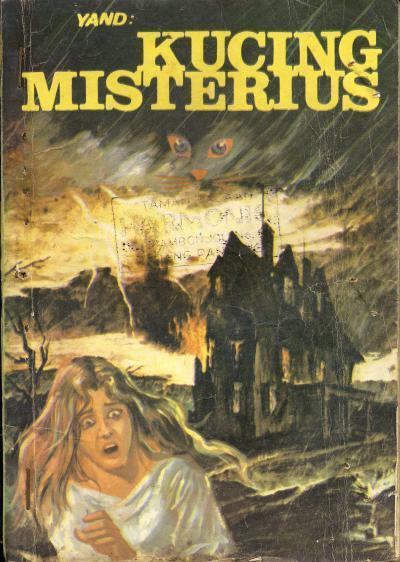 Kucing Misterius or The Mysterious Cat is the lead story in this digest-sized Indonesian comic. It has a registration date of 1-12-1980. The backup Star Wars story is Lumpur Galaxy or Mud Galaxy. It has a registration date of 15-10-1980 putting the publication of this comic in the early 1980s. This backup story is part of an ongoing serial that leads into the backup story in Tarzan: Elang Maut. This story starts with Luke Skywalker, Han Solo, Obi-Wan Kenobi, Chewbacca, C-3PO, and R2-D2 all on the Millennium Falcon. Han Solo is called Hans Solo and C-3PO is called Treepioo. Since the only time these characters appeared together in the Falcon was when they traveled from Tatooine to Alderaan, presumably this tale is a detour during that trip. Celebrating the last day of the twelve days of C-3PO and R2-D2 covers! 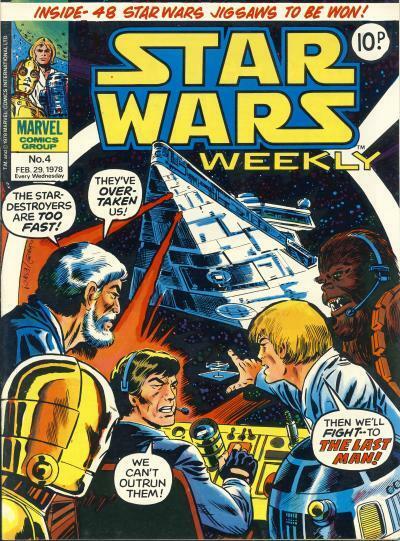 While the 6-part Marvel's Star Wars adaptation is perhaps the most printed U.S. comic around the world, there have been numerous retellings as well. 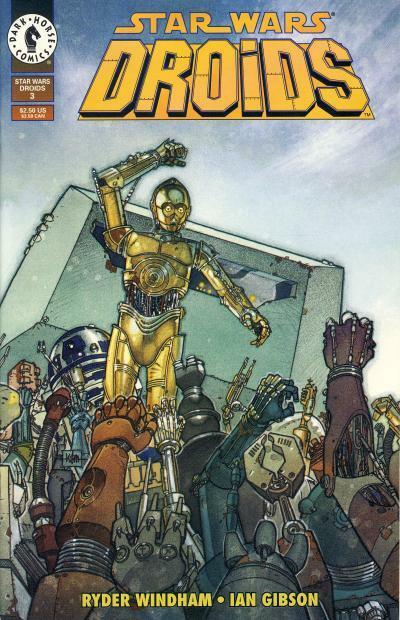 The most interesting issues of Marvel's Droids title are #6 - 8 which retell the story from the droids point of view. The recount starts the same as the movie aboard the Tantive IV. After the droids escape from the battle and crash on Tatooine, we see Darth Vader talk to Princess Leia aboard the Tantive IV like in the movie. This is interesting because neither droid was witness to the conversation. This occurs again when Leia is brought before Governor Tarkin on the Death Star. It would be easy enough to dismiss this as Leia conveying her part of the story to the droids but we also witness conversations aboard the Death Star during the Rebel attack. It is not possible for these conversations to be overheard by the droids. No doubt, the writer could not find an easy way to tell the story strictly from the point of view of the droids, so these scenes were used. As C-3PO and R2-D2 leave the escape pod, they both fall into an underground cavern occupied by mole creatures. C-3PO communicates with the creatures and believes they are helping the droids out of the cave, but the creatures takes the droids to an giant acid lizard named Gotar instead. Gotar swallows the pair, but spits them out, freeing them from the cavern. The droids are captured by the Jawas and the movie is again followed until R2-D2 takes off from the Lars homestead looking for Kenobi. In the desert, R2-D2 stumbles upon a Sand Person encampment and hides from them under a Bantha. Discovered, R2-D2 uses a projection of a giant C-3PO to scare the Sand People away. The story then picks up with Luke and C-3PO finding R2-D2 the next day and they are attacked by the Sand People. Following the movie again, the issue ends with the droids being approached by Stormtroopers outside of the Cantina in Mos Eisley. 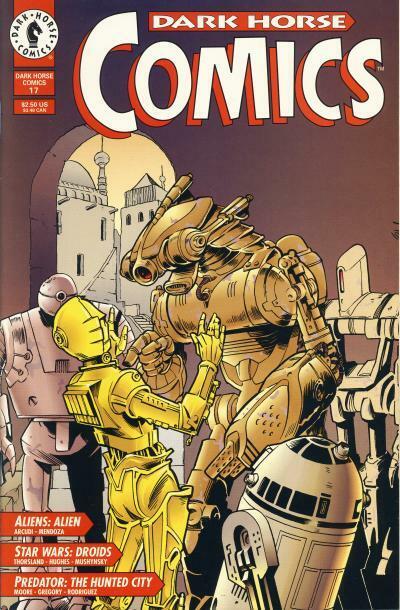 The cover centers on a portrait of C-3PO and R2-D2, giving them their due which was denied on the covers the Star Wars movie adaptation. (Actually, C-3PO and R2-D2 are not in the cover art for any of the Star Wars movie adaptations from Marvel, although they do appear in the upper left hand corner character box starting with the first issue of The Empire Strikes Back adaptation. Even worse, they are not show on any of the covers for The Phantom Menace or Revenge of the Sith adaptations either. For two characters that are in every Star Wars movie to date, their lack of cover appearances is disconcerting.) Surrounding the droids are Vader and Obi-Wan dueling to their left and Luke, Leia, Han Solo, and Chewbacca to their right. Below their portrait is the Millennium Falcon. All of this is against a blue starred background, making this cover perhaps the most detailed of all the Marvel Droids covers. Celebrating day eleven of the twelve days of C-3PO and R2-D2 covers! 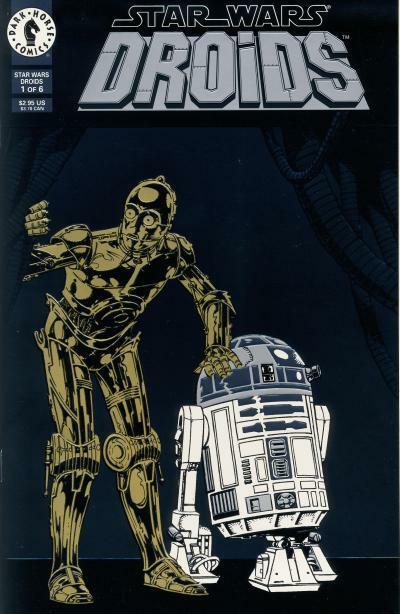 While there is a dearth of droids on the U.S. covers of the adaptation of Star Wars, the U.K. Star Wars Weekly has four covers that show C-3PO and R2-D2. 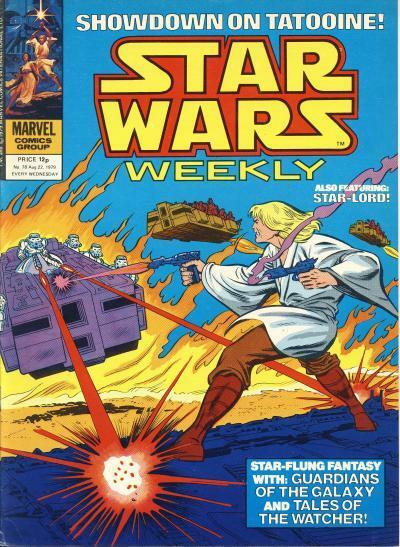 The cover for Star Wars Weekly #2 shows the Sand People attacking Luke Skywalker. R2-D2 is in the foreground and C-3PO, sans arm, is shown sitting on a rock in the background. 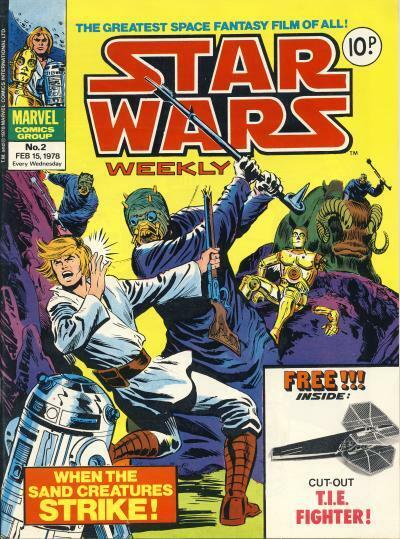 1978 was not a leap year, so it is funny seeing February 29th on the cover for Star Wars Weekly #4. The actual date should be March 1, 1978. The cover shows a more harrowing escape from the Star Destroyers near Tatooine than was shown in the movie. In the cockpit of the Millennium Falcon are Luke, Han Solo, Chewbacca, Ben Kenobi, C-3PO, and R2-D2. Luke's bravado fits with his character at this point in the story. 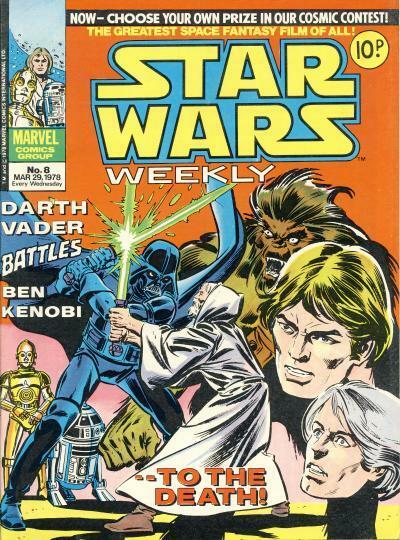 Star Wars Weekly #8 shows the duel between Darth Vader and Obi-Wan. Overseeing the battle are C-3PO and R2-D2. Visages for Luke and Han are superimposed on a drawing of Chewbacca. Obi-Wan's robe is uncolored as well as Luke's hair. Overall it is a confusing cover made more so because of inconsistent shadowing beneath the characters. The cover for Star Wars Weekly #10 is both cool and odd. The hidden fortress mentioned on the cover is the Rebel base on Yavin 4. The heroes are riding a troop transport into the Massassi Temple. Why there are weapons aimed at the heroes and why they look prepared to fight is unknown. 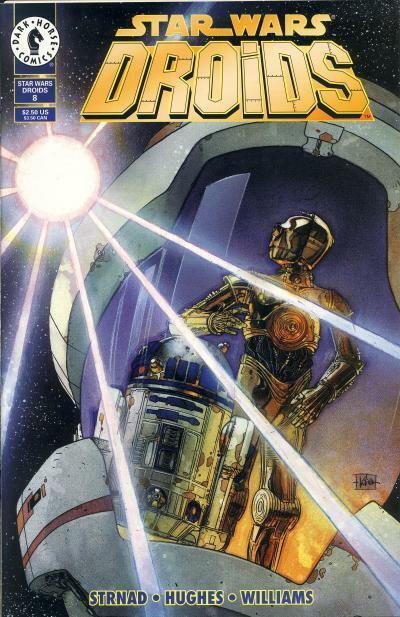 R2-D2 is also shown and mentioned on the cover of Star Wars Weekly #11. While the droids are not the focus on any of these covers, it is nice to see they were not forgotten. Celebrating day ten of the twelve days of C-3PO and R2-D2 covers! 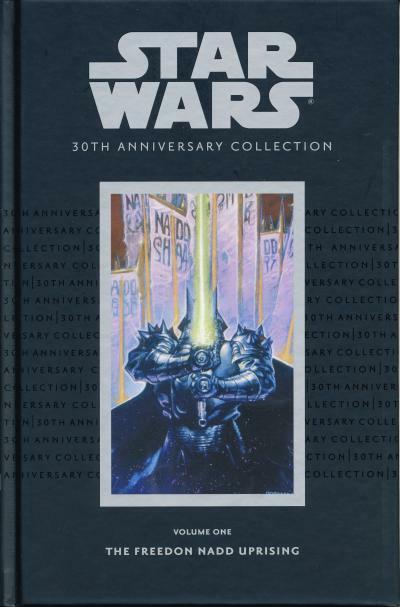 Dark Horse released several limited edition Star Wars hardcovers over the years for select mini-series including Dark Empire, Dark Empire II, Shadows of the Empire, and The Phantom Menace. 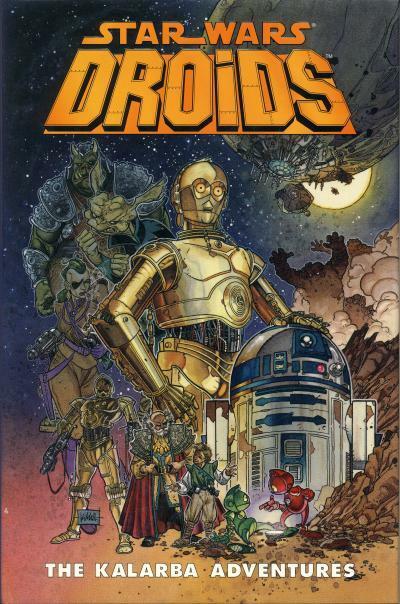 A limited edition Droids - The Kalarba Adventures hardcover was released in June 1996. The book contains Dark Horse Comics #17 - 19, the 6-part Droids mini-series, and an eight page story from Topps' Star Wars Galaxy Magazine. The dustjacket cover is by Kilian Plunkett and is the same art used on the trade paperback. The hardcover is limited to 1000 copies signed by Anthony Daniels. The cover is a montage of notable characters featured in the stories. Celebrating day nine of the twelve days of C-3PO and R2-D2 covers! 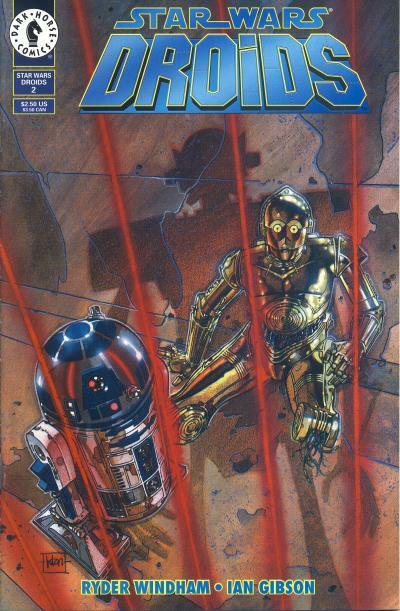 Nearly two years after the last Droids comic, Dark Horse published The Protocol Offensive one-shot starring C-3PO and R2-D2 in September 1997. The story has a serious tone unlike it's predecessors and also features a prestigious line-up of creators. The plot is by Brian Daley who wrote the three novels Han Solo at Star's End, Han Solo's Revenge, and Han Solo and the Lost Legacy. Anothony Daniels, the actor who portrays C-3PO, is a co-writer along with Ryder Windham, editor at Dark Horse from 1993 through 1996 who oversaw many Star Wars titles. Painted art is provided by Igor Kordey, best known for his work on New X-Men when Grant Morrison was writing the title. The painted cover by Kordey shows C-3PO and R2-D2 reacting to the Hobors preparing for war with the Troobs on the planet Tahlboor. The story does a great job of using the characters of C-3PO and R2-D2 in a serious manner, but also sprinkles in the humorous banter we've come to love between these two unlikely companions without degenerating into silliness. R2-D2 is headstrong and ready to act, while C-3PO is the reluctant hero goaded on by his diminutive friend. Admittedly, it is not the most exciting Star Wars tale, but I found it more engaging than many of the other droid-centric comics. If you like C-3PO and R2-D2 in the movies and feel these two characters are underserviced in most stories, you will enjoy this book. Celebrating day eight of the twelve days of C-3PO and R2-D2 covers! Fortunately it does end. While this series was not designated a mini-series, it only lasted eight issues. The same month issue #8 came out, Heir to the Empire #3, Splinter of the Mind's Eye #1, Boba Fett one-shot, Tales of the Jedi - Sith Wars #5, and Rogue Squadron #6 were published. Dark Horse's Star Wars line was expanding rapidly and almost all these issues sold twice as many or more copies as Droids #8. I have a confession to make, I did not read all eight of these issues. I read enough to know this series picks up right where the mini-series left off. Usually I read the comics before I make a posting, but I really am not a fan of the slapstick humor that infests this series. I did read the previous 6-part mini-series and that was enough for me. I don't mind humor in Star Wars when it is organic to the story, but I want the subject matter to be treated seriously. These stories were not written for me, which is fine; the Star Wars galaxy is big enough for all sorts of tales and I'm not going to like all of them. Instead I will just show the incredible covers by Kilian Plunkett.